My memory stuck in Jodhpur (Rajasthan) it was mid June, very hot and dry climate all around, the climate was really unbearable in day, it used to become pleasant after mid night. The experience, which I am going to share with you is very rare, even such experiences are not desirable. I am really fortunate to have such experiences in my life; it really engraved in my mind; after so many years, the memories did not fade out. Our Unit had to move for Exercise (Passive Air Defense) to a place called ‘Khuri’. You all know about ‘Sonar Kella’, which is in Jaisalmir, many of you might have visited ‘Sonar Kella’ and enjoyed SAAM desert too. I am talking about a place, which is around 155 kilometers further from ‘Sonar Kella’, the place named ‘Khuri’. 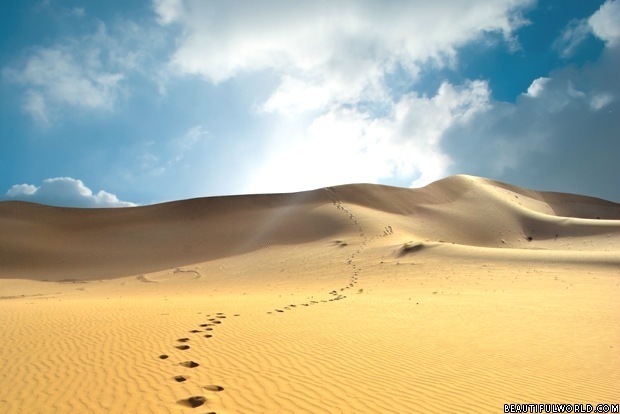 You won’t find any human being around 100 kms, only sand absolute desert. Our Unit convoy moved to that place. We started early in the morning from Jodhpur with 13 vehicles in a convoy and fortunately I was the convoy commander (only to and fro). Driving in front of the convoy in a jeep for two days and one night. We have driven whole night and took little rest in day time. It was not easy, but really thrilling and adventurous. Around 5.30 pm we reached ‘Khuri’, as we left Jaisalmir and was going further towards ‘Khuri’ we could noticed slowly the huts… trees….. Bushes… were reducing …. And finally around 100 km from Khuri there was no sign of living things. As soon as we reached to khuri, as it was late afternoon, our NCE’s (Non Combatant Establishment) who are the supporting staffs of Indian Air Force unloaded the vehicles and were fixing the tents for us, where we will leave for around 14 days. Including Commanding Officer we 19 personnel have to be accommodated. Except Commanding Officer, Adjutant and Technical Officer rest all would be sharing two persons in one tent, accordingly, 3 single, 8 double and one cook house total 12 tents were erected. This was my first experiences in tent life. After erection of our tent, I could notice deputed NCEs were digging the sand around each tent where we have to live. Surprisingly, I asked them, why should they were digging the sand around the tents? Listening me they were looking each other’s face, I have again repeated my question; they did not reply my question, only said, while laughing “Sir, You will get your answer tomorrow morning”. I was little disappointed getting such reply from them. Within 35 munities all the tents were ready, and another an hour dinner was served. It was around 8.30 pm, we have finished our dinner. Totally exhausted, feeling tired and sleepy because of extensive continuous driving for two and half days, went to bed and fallen in deep sleep. Next day, my friend Mr. Venugopal who was accommodated with me in same tent, shook my hand and inform me that it was 5.45 am, I got up from the bed, have to prepare for the mission for what we have come (I cannot write any more regarding our mission, which was secret in nature and I am not suppose to disclose, I only want to share those, which is not related to our mission but may be rare in life). Just took my shoes on and was planning to go out of the tent for looking the surrounding area. While stepping out of the tent, suddenly I could noticed such thing, my blood became frozen, for a moment I was puzzled, not able to hold myself…. Shouting towards my friend….” Come on Venu… see… come immediately…” I saw hundred of desert snakes and Scorpios were scattered and scrawling over each other and trying to come up from the digging furrow surrounding our tent, and it all looks very poisonous. Suddenly could remember the answer of those NCEs who replied me, that morning I will get the answer of my question. I had gone to one of them and asked him about the utilities of such digging? They explain, the trench could only save a person from such poisonous reptiles , reason behind, they explained, the trench has got a specific sizes, one and half feet width and three feet depth, normally, the reptiles of desert area, while crossing fall in the trench cannot come up due to its specific size. I immediately gone near to my tent and observed keenly, yes, all the reptiles in the trench trying to come up but while climbing upwards they were again falling down. I was really astonished, seeing so many poisonous reptiles together, and was thinking the lesson, which I got it from those subordinate staffs (NCEs) which was rare in deep desert.